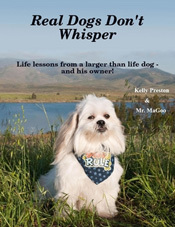 Amazon 5 out of 5 Stars – Amazing book for animal lovers!, Real Dogs Don’t Whisper is a very touching book that people of all ages can relate to. Animal lovers will adore it, but it includes life lessons for everyone. It is a story about the owner of four high-needs dogs and their adventures together. Even better, it’s a true story. It is well written and easy to empathize with. I recommend Real Dogs Don’t Whisper to everyone who has ever had a pet that they loved and shared a special connection with. This book will remind you how important that connection is and to cherish it for all it’s worth. Amazon 5.0 out of 5 stars Pet lovers will enjoy and learn from this story! You will laugh, cry, and learn from this well-written story by a pet lover and owner. It is easy to relate to in so many respects and brings back fond memories of my former pets. In fact, it motivates me to seriously think about getting another Lhasa Apso (our third Lhasa and 14th dog). Not just for dog lovers!! This is a must read for all animals and their humans…just be sure to have the tissue box nearby. I’m sure you’ll be laughing and crying at the same time.